All Oldfields students are encouraged to be self-advocates for receiving academic support. The learning specialist meets with all new students at the beginning of the year to explain the varied academic support services available at Oldfields. The academic support staff is available to all students and is able to provide assistance with organizational skills, note-taking strategies, and time management techniques. A one hour block is built into every class day’s schedule for students to receive extra help, if needed. Each faculty member is available to the students during this time. Students may also meet with faculty after school or, by appointment, in the evenings. 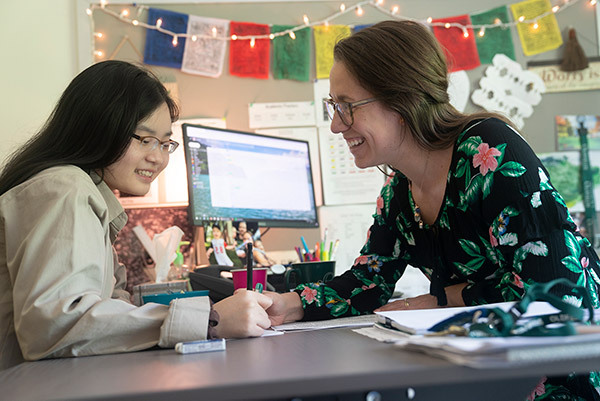 In addition to the extra help offered by the faculty, Oldfields has a learning specialist who collaborates with faculty to ensure the best academic program and support for each girl who needs it. A two hour study hall takes place Sunday to Thursday evenings. While most students study in their rooms, upperclassmen and Dean’s list students have “freedom of study” and may work wherever they wish on campus. On a weekly basis, faculty, dorm parents, advisors and administration meet to track each individual girl’s academic progress. Based on these recommendations, supervised “Academic Study Hall,” is offered for those students who need more structure on a nightly basis. Saturday morning study hall may also be assigned for those students who need structured time to complete assignments. Student tutors are available in all disciplines through the Peer Tutoring program. Students should contact the learning specialist to be assigned a Peer Tutor. Peer tutors and students work, by appointment, at mutually agreeable times. For students who need additional help, professional tutors may be hired by parents. These tutors work with students during free periods or in the evenings at mutually agreeable times. The student run Math Lab is open Monday through Thursday evenings to offer mathematics assistance to any student. The student run Writing Center offers assistance to any student who would like help with organizing, structuring, formatting or editing a paper. Once a student with documented learning disabilities has been admitted, the learning specialist reads the file, interprets the educational testing and creates an Oldfields Accommodation Plan for that student. This plan outlines for the student, her parents, advisor, and teachers, the accommodations necessary for her success at Oldfields. The School fully complies with the regulations stipulated by Educational Testing Service and ACT throughout the standardized testing process during the sophomore, junior, and senior years. Some of the accommodations provided for in an Oldfields Accommodation Plan include, but are not limited to: extended time on assessments, testing in a separate work area, using a computer for tests, having a reader for tests and quizzes, and preferential seating in class. If a student qualifies for an Oldfields Accommodation Plan, she is involved in the approval and implementation of the plan.